Australian Broadcasting Corporation. Peter Lerner speaks at 3:38. Map of area with landmarks. Map with location of the tents. There were four ambulances. I charted their movements. Ambulance 1. Picked up Ismail Bakr from the breakwater (violet X). Ambulance 2. Parked in front of the Beach Hotel and Orient House, then backed down to the Avenue Restaurant and Coffee Shop, where it waited until the bodies of the three other boys were produced. Moved forward and stopped on the street in front of the sandy incline to the beach. 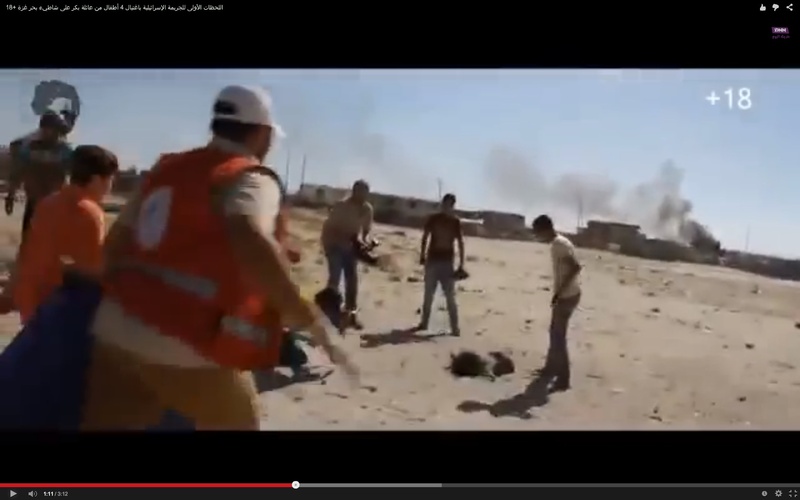 Here it collected the wounded Salafist bomber and the dead boy in the green shirt. Ambulance 3. Parked across the street from the Avenue Restaurant and Coffee Shop, waiting along with Ambulance 2. When word was received that the three bodies had been produced, Ambulance 3 went to the al Deira Hotel to pick up Hamad Bakr and Muntaser Bakr. Ambulance 4. Arrived as the wounded man was being loaded into Ambuance 3. After the paramedics ran to the beach to collect the final two corpses, someone moved the ambulance to the sandy incline between the Avenue Restaurant and Coffee Shop and the al-Andalus Wedding Hall and Restaurant. The two dead boys were loaded; Ambulance 4 then drove to the al-Deira Hotel and joined Ambulance 3. Both sped off to al-Shifa Hospital. Much of the information is in this video, which has been edited to confuse the sequence of events. First ambulance arrives at 2:21. 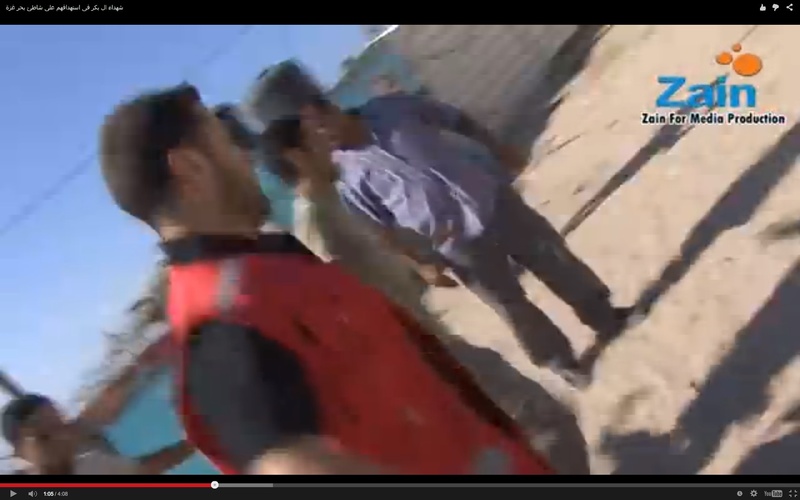 Hamas commander in the purple shirt shows it where to park. 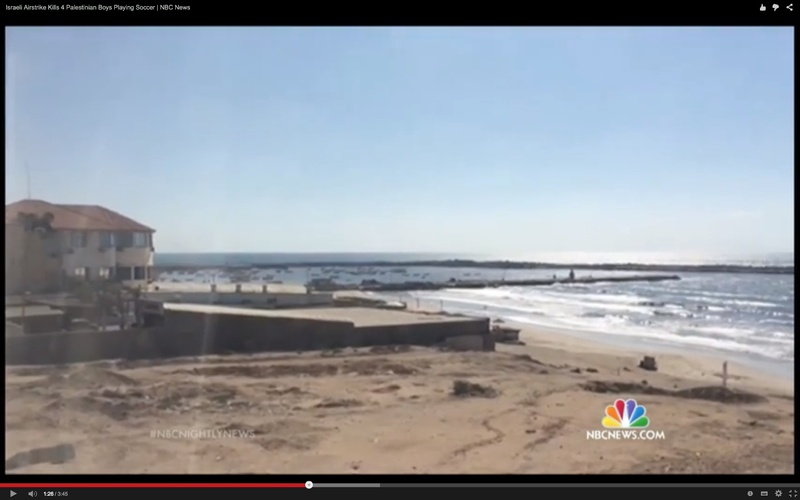 TV truck drives to breakwater at 2:41. Huge crowd of reporters and Hamas operatives at 3:09. 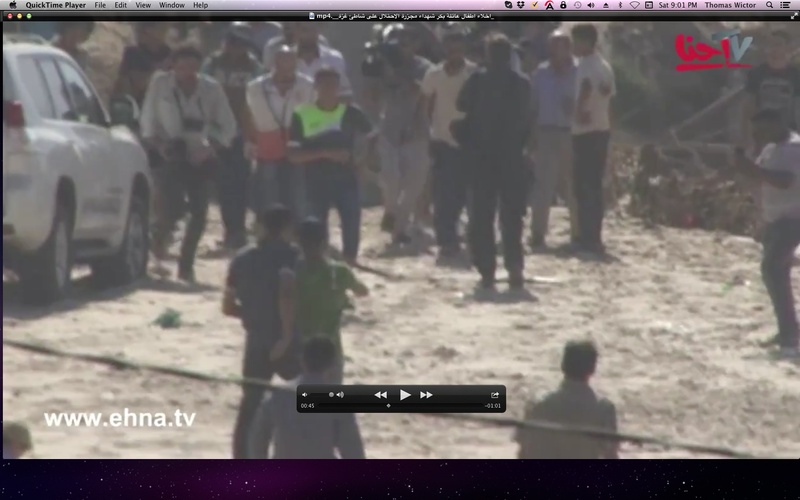 Hamas commander in tan shirt at 3:35. 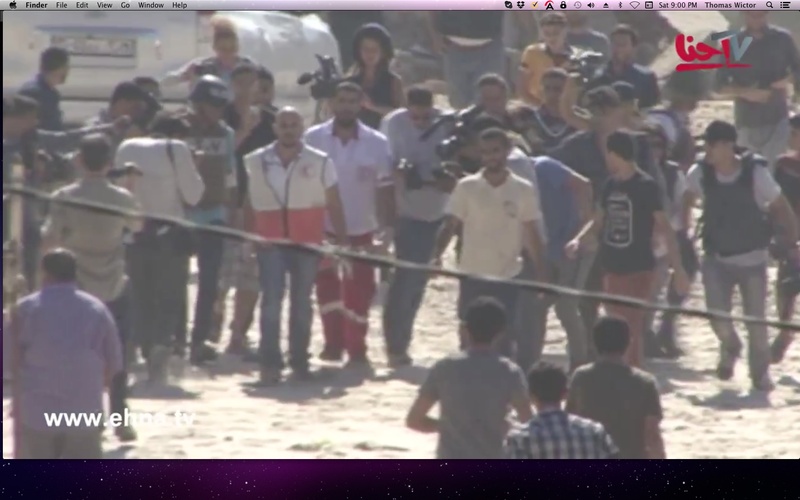 Hamas commander in purple shirt at 3:36. Second ambulance arrives, parks in front of Beach Hotel and Orient House, 0:08. The paramedics run to the beach, turn around, and come back to the ambulance. The ambulance then parks down the street at the corner of the Avenue Restaurant and Coffee Shop. 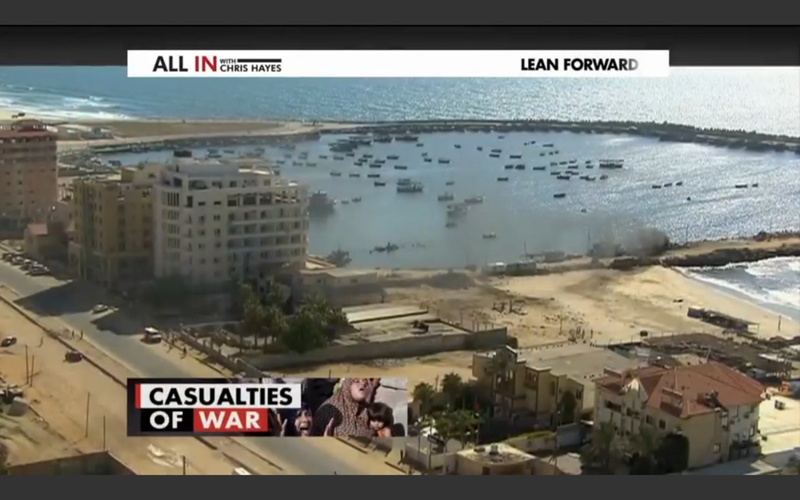 Screen grab from from All in With Chris Hayes, “Four Boys Killed on Gaza Beach,” MSNBC, 2:02. 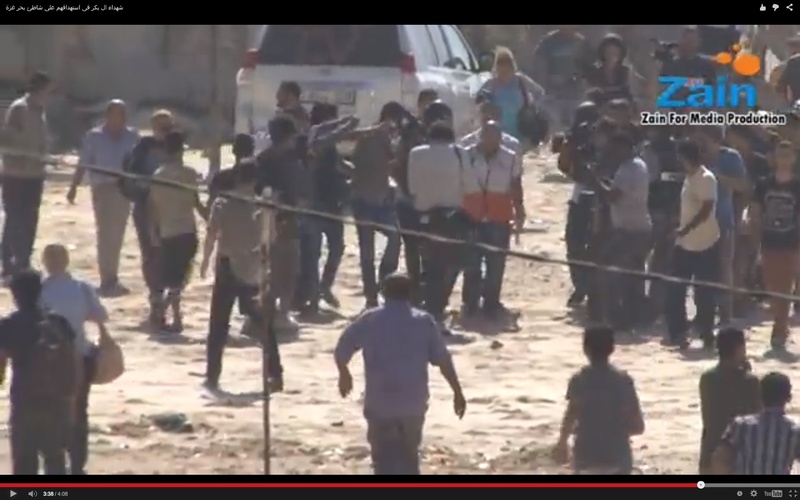 You can see that after the body of Ismail Bakr is taken away, almost all of the Western reporters leave the area. Only Tyler Hicks of the New York Times remains. Then the ambulance that was parked at the corner of the Avenue Restaurant and Coffee Shop races toward the empty lot between the Avenue Restaurant and Coffee Shop and the al-Andalus Wedding Hall and Restaurant, 0:11 in the Zain video. 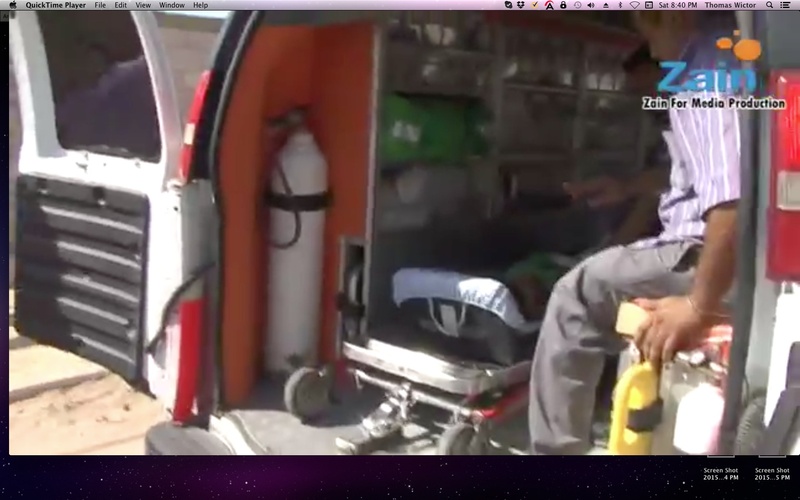 ITV video shows a third ambulance parked across the street from the second ambulance, 0:17-0:23. This third ambulance will go to the al-Deira Hotel and pick up Muntaser and Hamad Bakr. The white flag on the roof identifies it. The second and third ambulances leave the Avenue Restaurant and Coffee Shop together. 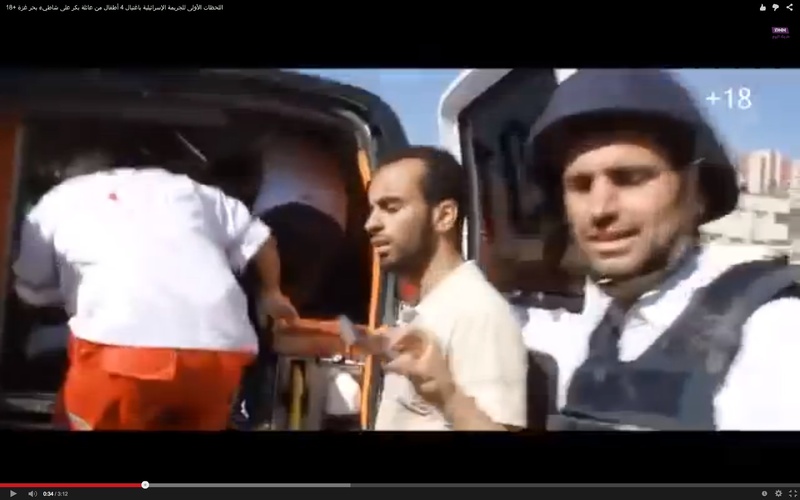 Zain video, 0:15, shows that the body of Mohammed Bakr (green shirt) has been put in the second ambulance. 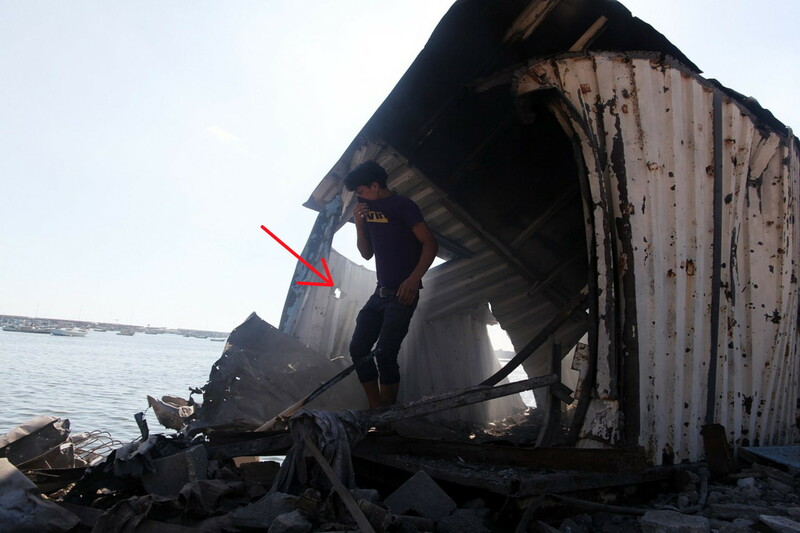 The Hamas commander in the purple shirt sits inside. 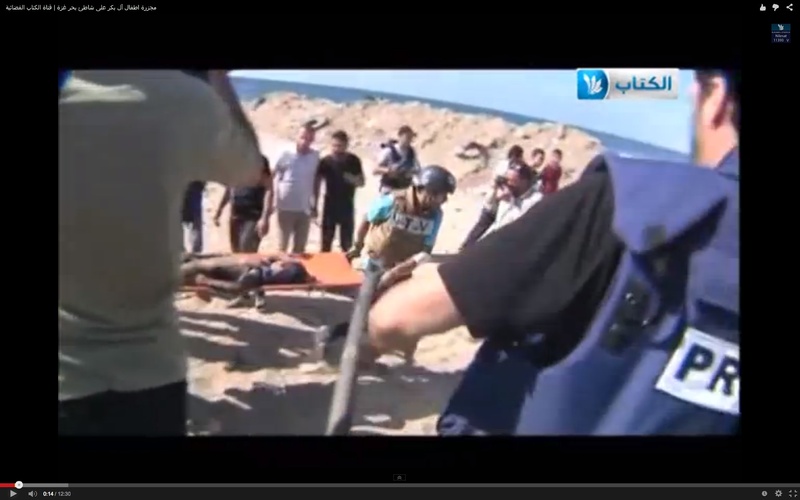 Al Mayadeen News video shows a bloodied man removed from the blue tent on the beach, 1:00. 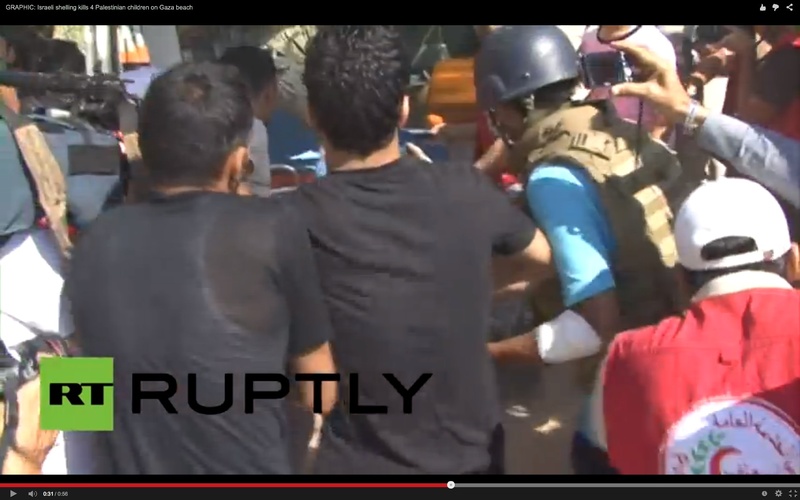 Euronews: The wounded man is handed off to another man, 0:57. 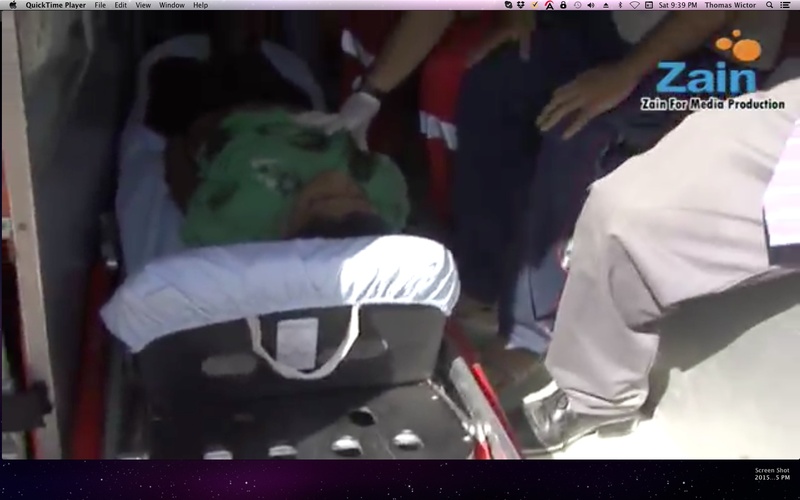 Ehna TV: T he wounded man is put in the second ambulance with the body of Mohammed Bakr, 0:12-0:24. 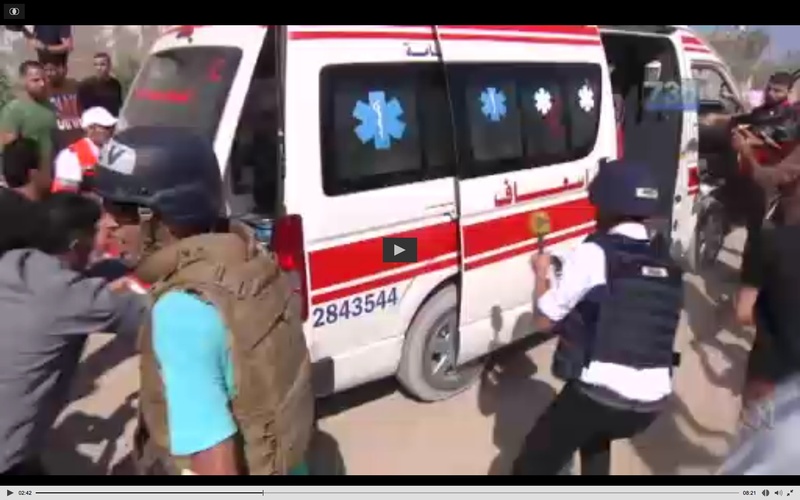 The Hamas commander in the purple shirt and the second-in-command in the tan shirt get out of the ambulance and stand guard. Soon after the wounded man from the beach is put in the second ambulance, the fourth ambulance arrives and parks across the street. 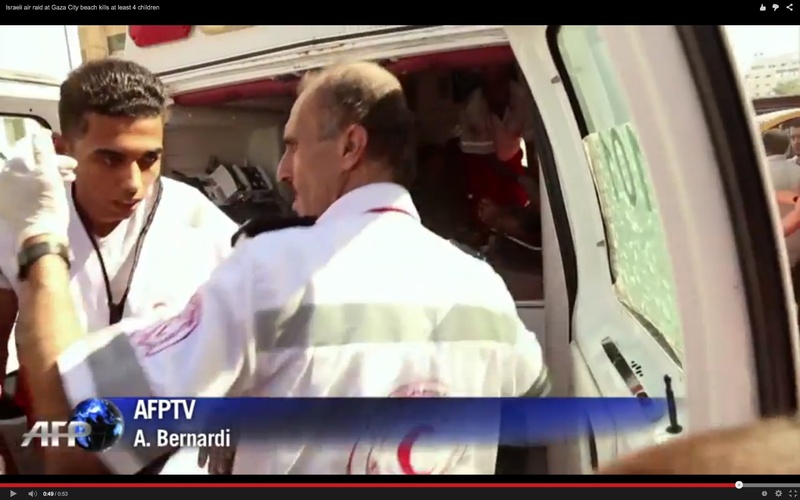 Cameraman Mohamed Jabaly accompanies the paramedics who run to the beach. 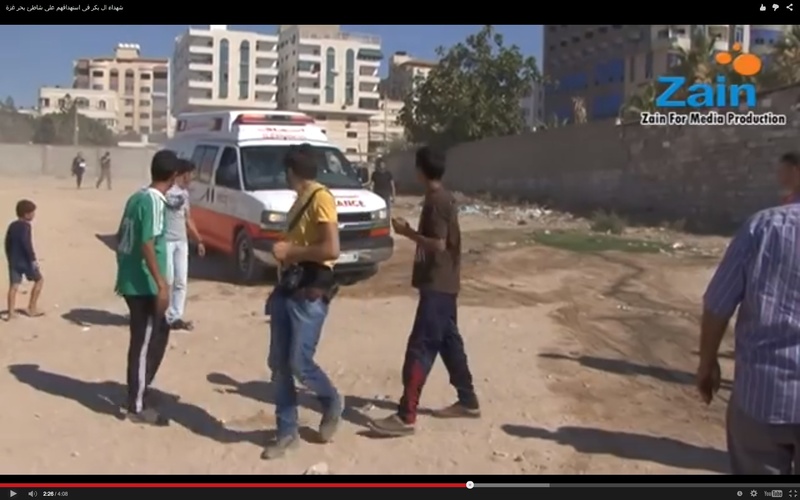 Jabaly films the Hamas second-in-command standing guard behind the second ambulance, 0:34. 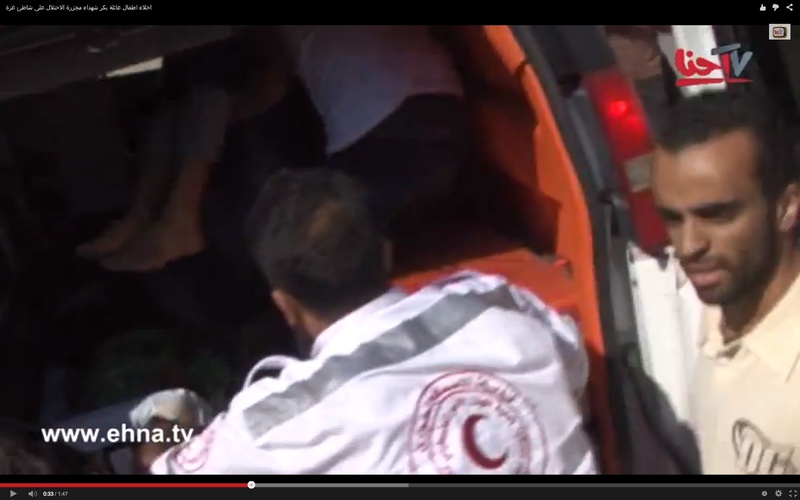 The paramedics from the fourth ambulance collect the bodies of Ahed Bakr (red shirt) and Zakaria Bakr (gray shirt). After the bodies of the two boys are loaded into the fourth ambulance, that vehicle drives to the al-Deira Hotel to join up with the third ambulance, which is carrying Muntaser Bakr and Hamad Bakr. 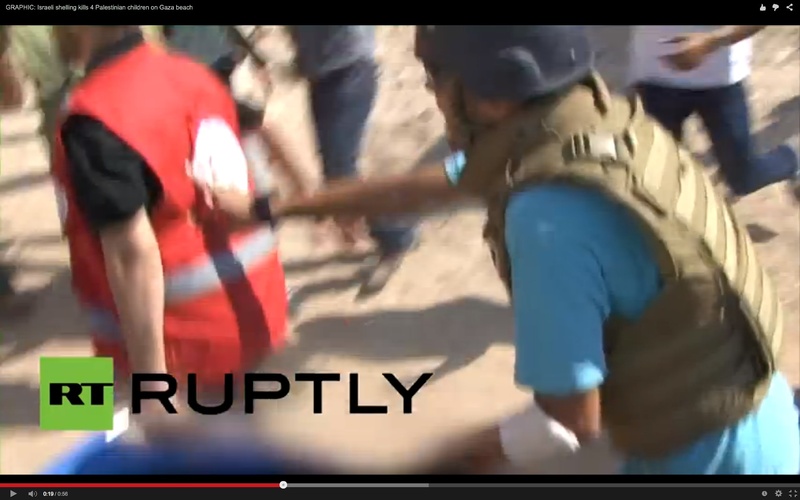 AFP prevents its videos from being embedded. 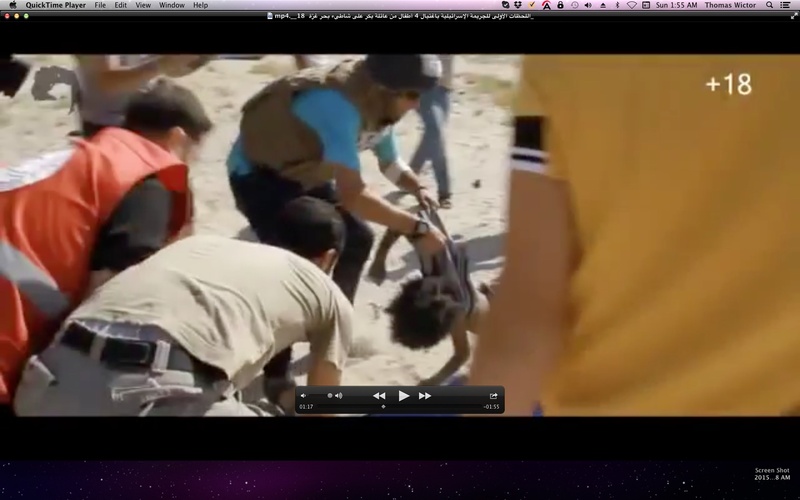 At 0:49, Muntaser has been put on the left, and Hamad on the right (bare foot). 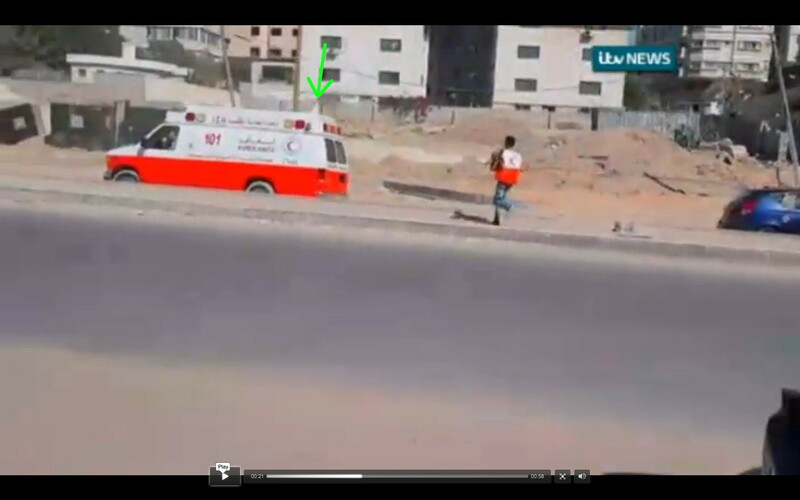 At 0:52, the third ambulance (white flag) is followed by the fourth ambulance to al-Shifa Hospital. The key is the Mohamed Jabaly video. It shows that the bodies of Ahed and Zakaria Bakr were collected before the ambulance carrying Mohammed Bakr had left. 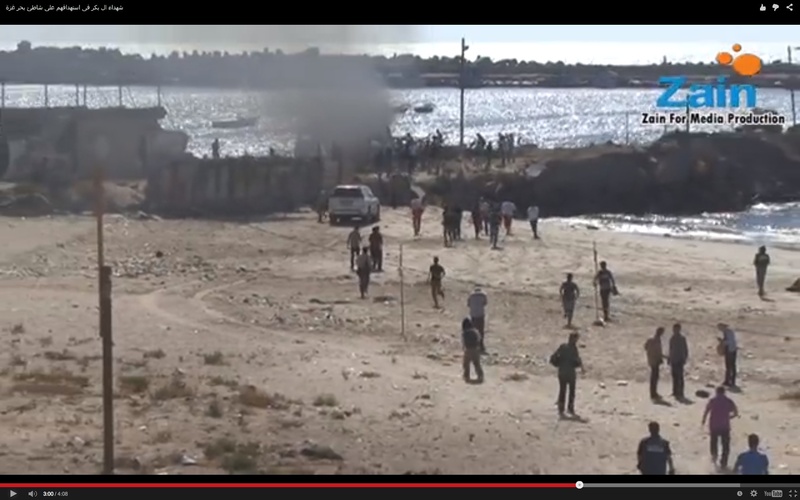 It also shows that the area around the breakwater was empty of journalists. 2. Journalists run to breakwater. 3. Ismail Bakr removed from steel container and taken away. 4. 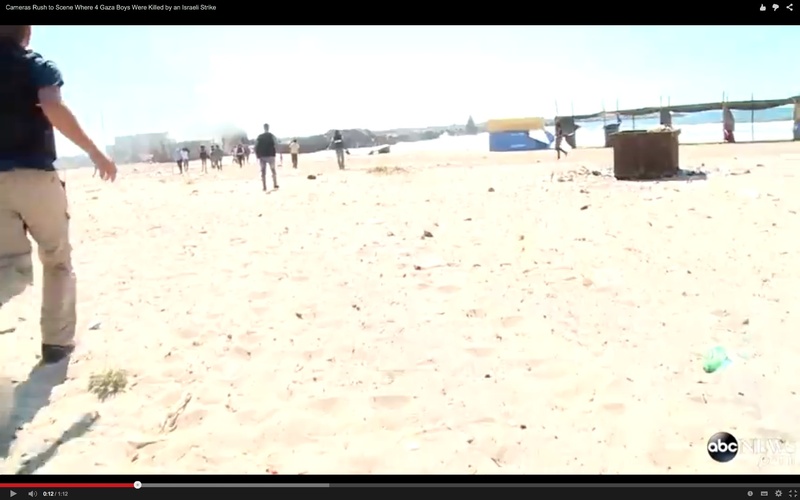 Journalists leave the beach. 5. Second ambulance arrives, parks in front of Beach Hotel and Orient House, then moves to corner of Avenue Restaurant and Coffee Shop. 6. Third ambulance arrives, parks across the street from second ambulance. 7. After the bodies of Mohammed, Ahed, and Zakaria Bakr are produced, the second ambulance moves forward to park in front of a vacant lot between the Avenue Restaurant and Coffee Shop and the al-Andalus Wedding Hall and Restaurant. 8. The third ambulance goes to the al-Deira Hotel to pick up Muntaser and Hamad Bakr. 9. The fourth ambulance—with Mohamed Jabaly on board—arrives and parks across the street from the second ambulance. 10. The bodies of Ahed and Zakaria Bakr are collected LAST, not first. 11. The fourth ambulance drives to the al-Deira Hotel, here it joins the third ambulance. 12. The third and fourth ambulance leave the al-Deira together, heading for al-Shifa Hospital. 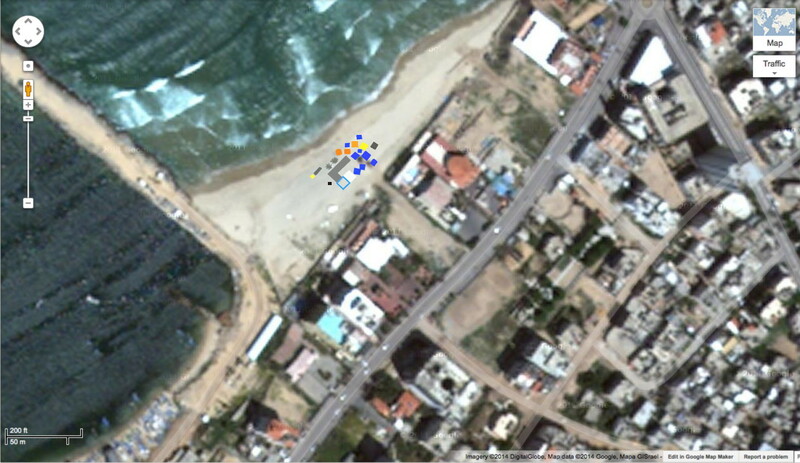 News footage proves that three bodies were placed on the beach later. In interview conducted by film crew sent to Gaza, Commodore Hotel worker Muhammed says that western reporters arrived on the scene within two minutes. Alex Marquardt of ABC News immediately runs to the breakwater after the two explosions. 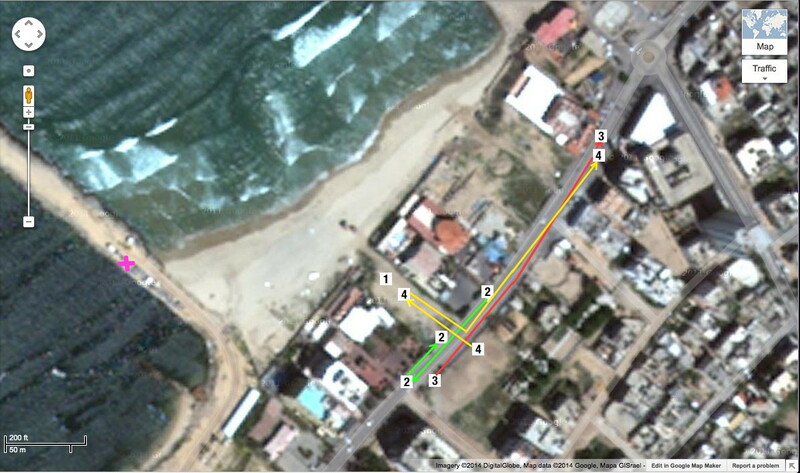 As he runs past the place in the sand where the three bodies will later be “found,” we can see that it’s empty, 0:12. Stefanie Dekker of al-Jazera photographs the removal of Ismail Bakr’s body. The procession walks right past the area where the three other bodies will be found, 0:33. At 0:38 Stephani Dekker says that the three other bodies were “found further up the beach.” In reality the bodies were found in the area of her photograph. 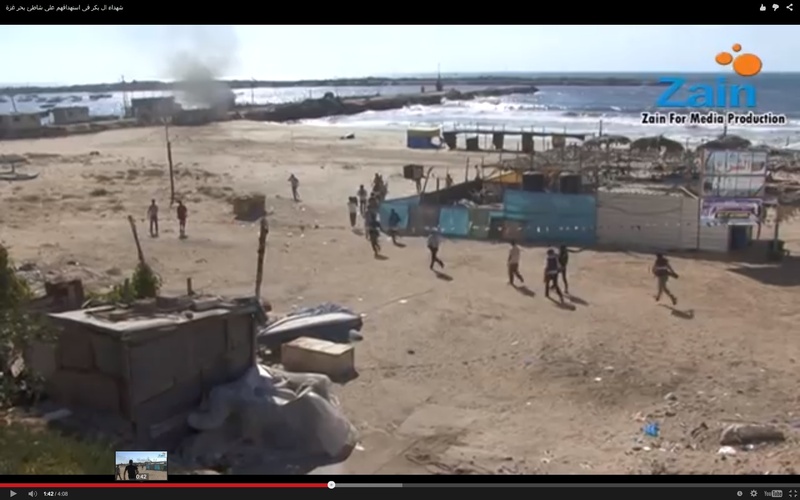 The Zain for Media Production Company video (above) shows reporters running to the breakwater past the place where the three bodies will later be found, 1:42. The steel container isn’t burning. 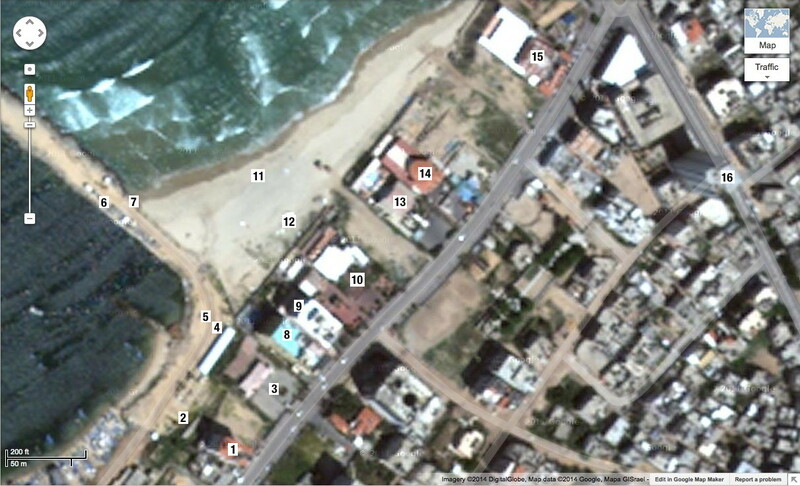 The photos show a projectile hitting the ground between the Avenue Restaurant and Coffe Shop and the al-Andalus Wedding Hall and Restaurant, but there was no crater in the sand. I made a gif that shows how the base of the explosion moves from side to side, but the column of smoke doesn’t grow taller. Impossible. There’s no crater anywhere between the Avenue Restaurant and Coffee Shop and the al-Andalus Wedding Hall and Restaurant. A man in a purple shirt is present everywhere, from the al-Deira Hotel to the breakwater. Here he is supervising the removal of Mohammed al Watfah, who claimed to have been injured in the Avenue Restaurant and Coffee Shop and put in an ambulance there. 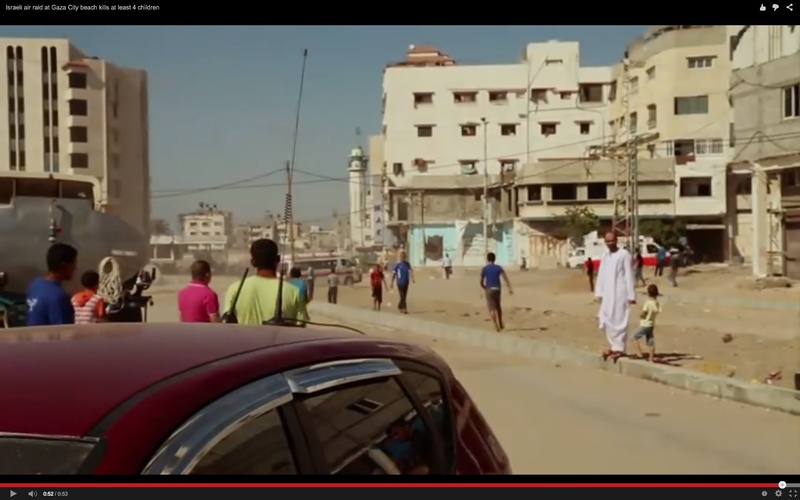 Channel 4 News, the Hamas commander holds the taxi door while Watfah is place inside, 0:17. This man can be seen in every single scene from that day. 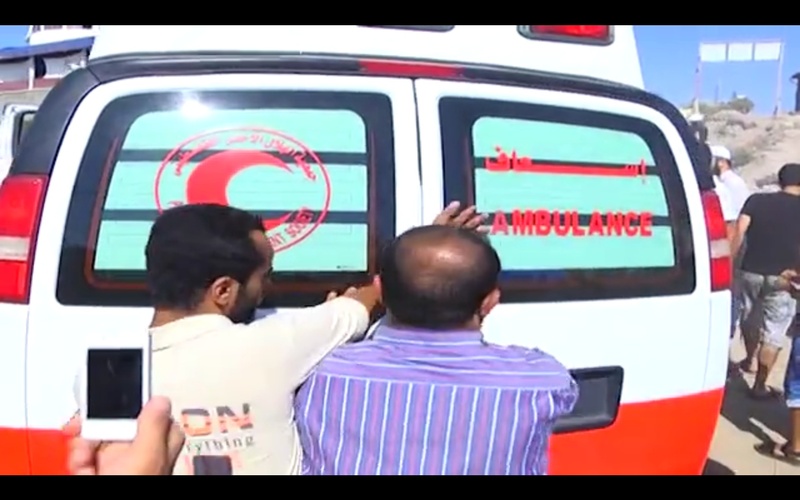 The Hamas commander showing the first ambulance where to park. 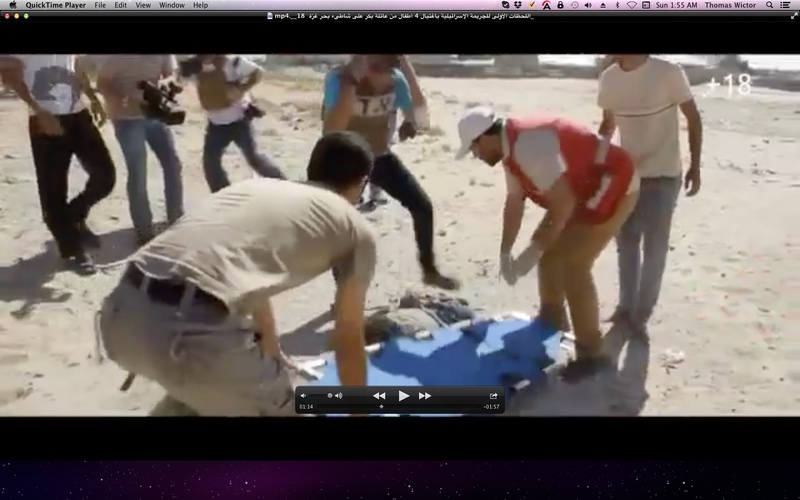 Watching as the paramedics remove the body of Ismail Bakr. Following the paramedics to the first ambulance. Shutting the doors of the first ambulance, joined by the second-in-command (tan shirt). Accompanying the paramedics of the second ambulance as it leaves the corner of the Avenue Restaurant and Coffee Shop. Sitting in the second ambulance with the body of Mohammed Bakr. Supervising the removal of the bodies of Ahed and Zakaria Baker. The second in command in the tan shirt was just as busy. 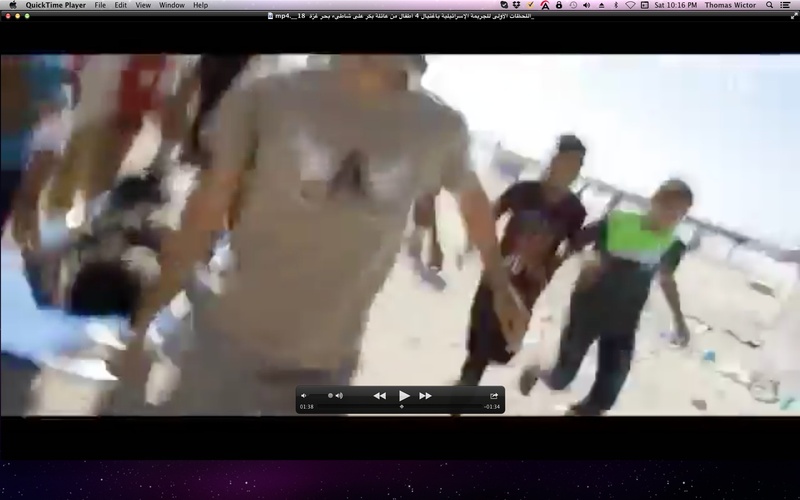 Here he is in the AFP video from above, at the al-Deira Hotel, observing Mohammed al Watfah’s performance. He oversaw the removal of Ismail Bakr’s body. He even arranged the child’s body on the stretcher. Then he went on ahead to the first ambulance. He and the commander closed the doors of the first ambulance. 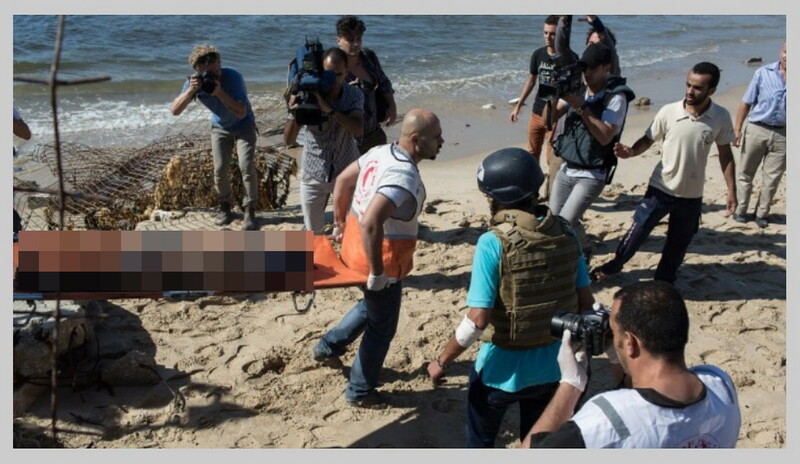 Here he has just been handed the corpse of Mohammed Bakr, from All in With Chris Hayes, “Four Boys Killed on Gaza Beach,” MSNBC, 2:04. He carries the dead boy to the second ambulance. He gets in and sits beside the commander; you can see his dark-blue running trousers. 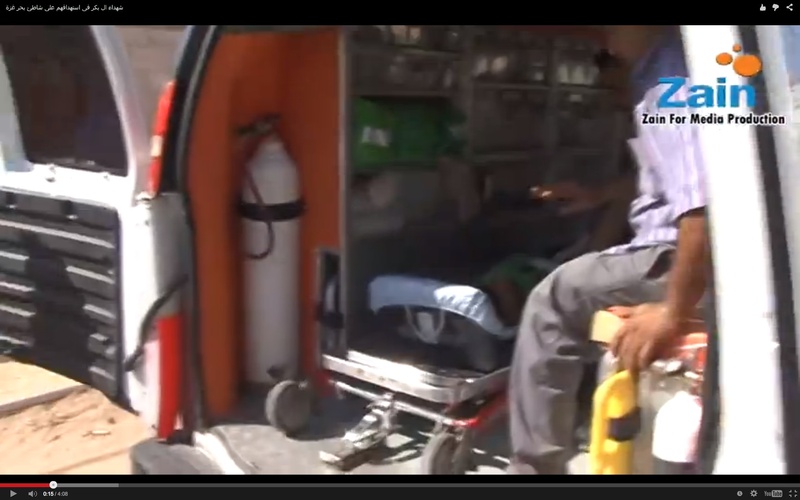 Then he and the commander get out of the ambulance when the injured man is put in. 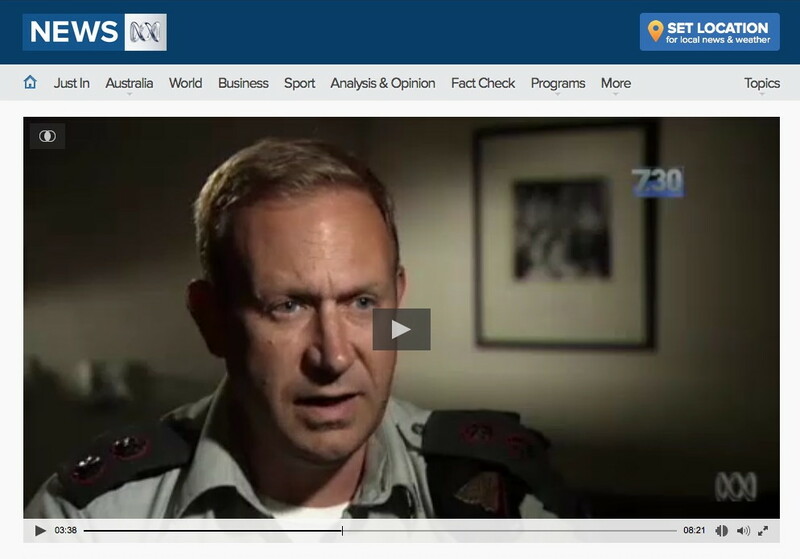 Australian Broadcasting Corporation, ABC News, “Family of Boys Killed by Airstrike on Gaza Beach Speak,” 3:35. 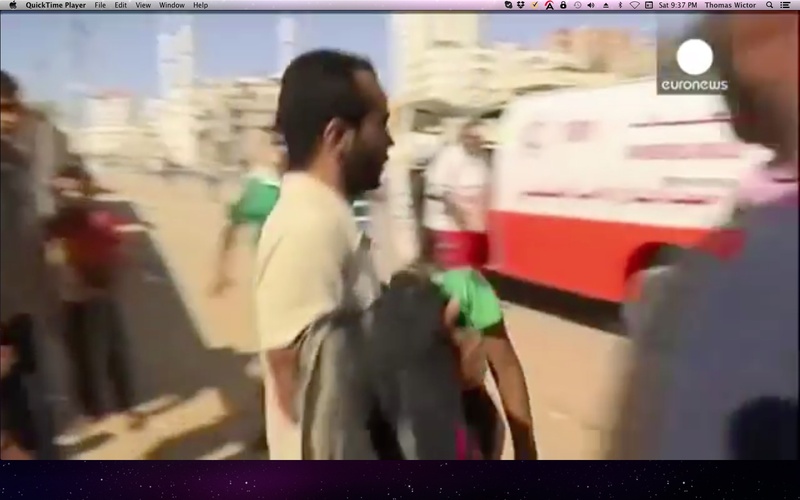 He was standing guard by the second ambulance when the fourth ambulance arrived, as filmed by Mohamed Jabaly. There were two field commanders as well. One wore a shirt with a dayglo green panel. He “found” Ismail Bakr’s body on the breakwater. Then he went ahead of the paramedics. 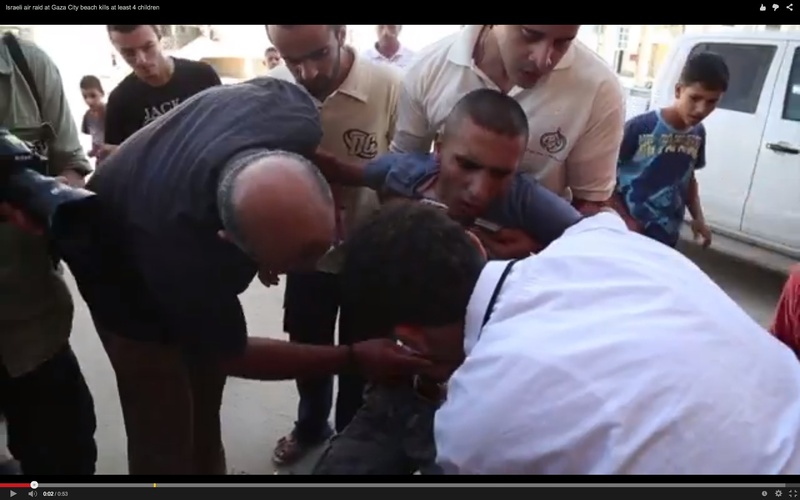 While Mohammed Bakr’s body was being carried to the second ambulance, he helped pull the wounded man from the tent. Finally he supervised the removal of the bodies of Ahed and Zakaria Bakr. The second field commander is Hamood Abu Kwaik, driver and fixer for Tyler Hicks of the New York Times. 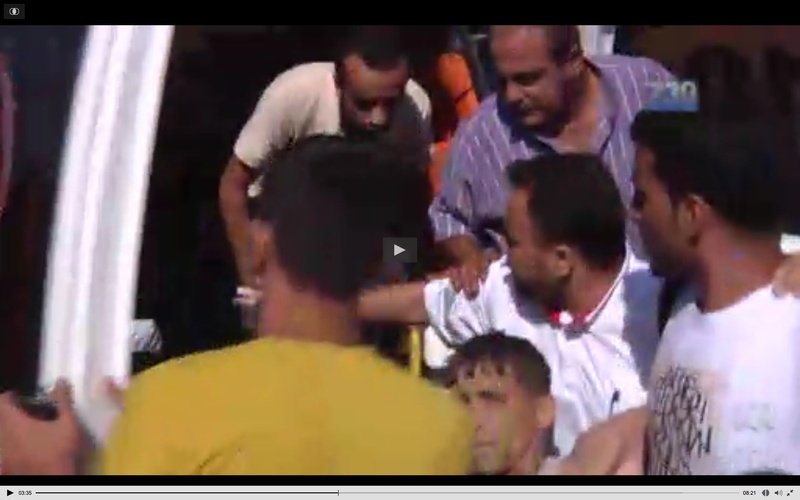 Kwaik took total control of Ismail Bakr’s body, directing paramedics where to carry him, 0:14. 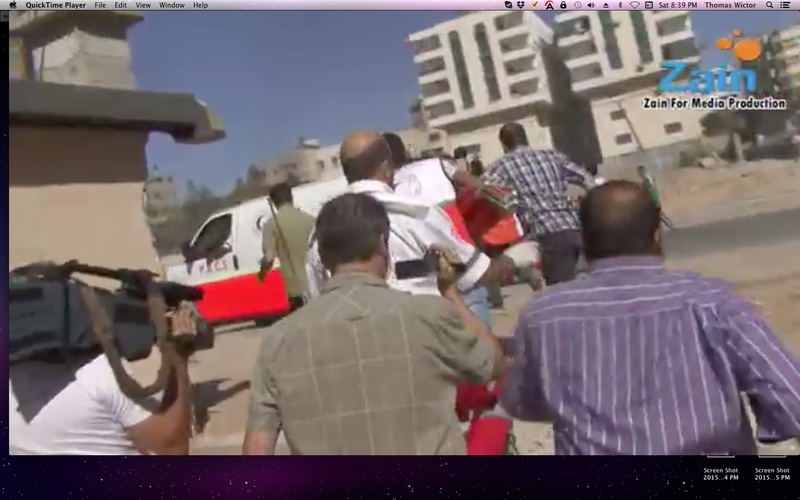 He supervised the transporting of Ismail Bakr’s body to the ambulance. After Ismail Bakr’s body is taken away by the first ambulance, Kwaik is involved with the preparation for the transporting of Ahed and Zakaria Bakr’s bodies (background). 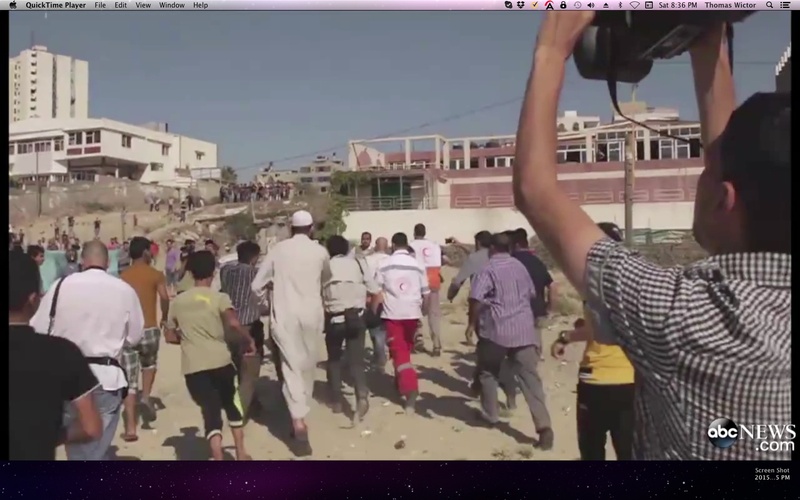 Although he has already seen the bodies, he reacts in horror when Mohamed Jabaly films him. Then Kwaik—a driver for the New York Times—is the man who puts the two corpses on the stretcher. 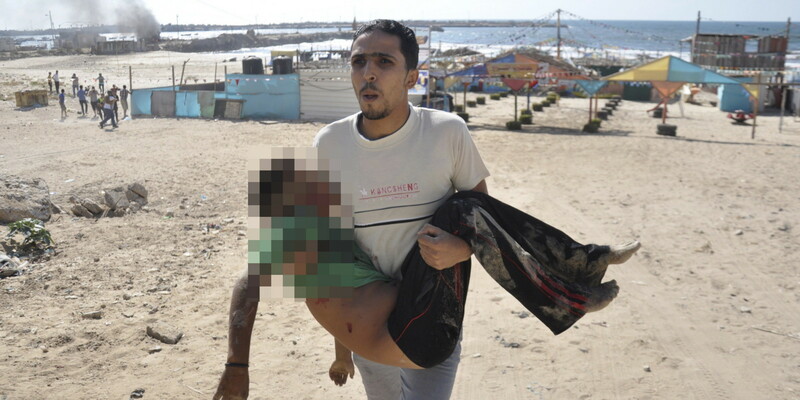 As they carry the two dead boys to the fourth ambulance, Kwaik manually directs the paramedic in front of him, RT, “Israeli Shelling kills 4 Palestinian children on Gaza beach, 0:19. The boys’ bodies are put in the ambulance. Kwaik is finished at the beach. Every man in this collage is directly involved in the operation. The angle is correct for 5:00 p.m. Because of the irregularity of the sand, the shadows look shorter. 1. Ahmed Abu Hassera, 22, waiter at the Beach hotel and Orient House. 2. Mohammed Abu Watfah, employee of the Avenue Restaurant and Coffee Shop. Muhammad both heard and felt an explosion near the coffee shop. He ran outside to check on the children, only to see that they were running towards him in an attempt to escape. Muhammad recalls that the children looked terrified. 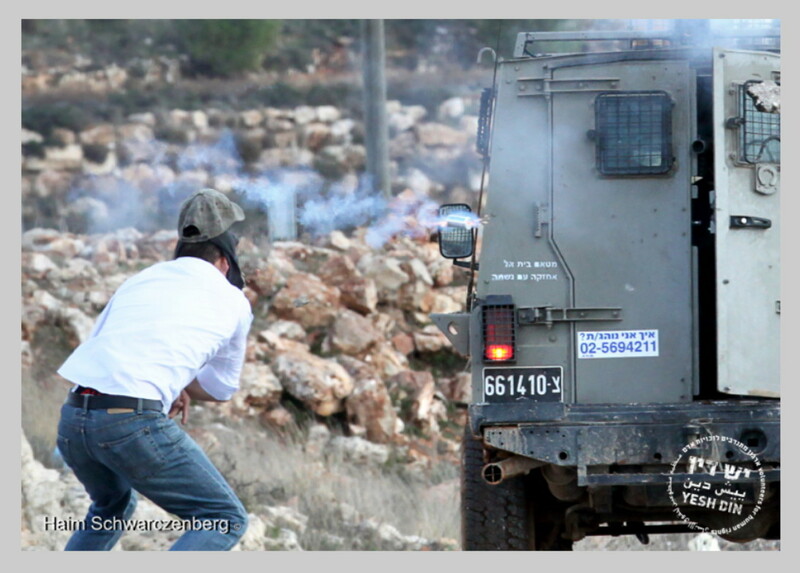 One of the boys screamed at Muhammad to call an ambulance as his brother was wounded. Then another bomb hit the boys as they were running. As the smoke of the bomb settled, Muhammad saw four of the boys’ bodies on the ground scattered and dismembered, while the surviving three boys hid behind a garbage can. Muhammad ran towards them and called for help. The coffee shop where Muhammad works was shelled as well. Muhammad saw his colleague, Fahd Abu Sultan, 23, lying on the floor drowned in blood. Moments later, many journalists were at the beach taking pictures of the children. An ambulance arrived and Muhammad helped carry the children. Muhammad then noticed that he too had been injured and was bleeding in the lower parts of his stomach. He was transferred to the hospital along with Fahd and the children. 3. Ahmad Thabet, 24, a worker for a Malaysian aid agency. 4. 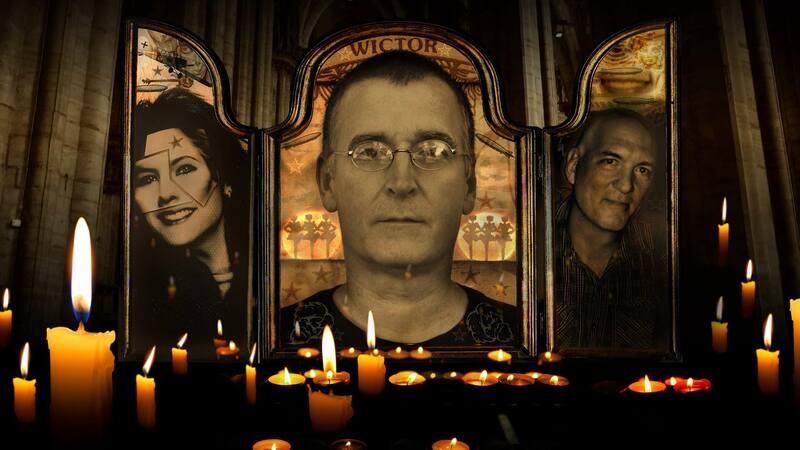 Gallagher Fenwick, France 24. 5. Sharif Abdel Kouddous, Democracy Now (same source as above). 5. Tyler Hicks, New York Times (same source as above). “And I just, you know, heard a loud explosion, a big crack right outside the window. I immediately looked outside, with my—my driver was here with me. And I could see just this part of the port, this jetty that goes out into the water, just outside my window, with a small structure, really just like a little shack, that had just been hit by a bomb. And at that time, I could just see one child running away from that into the open sand. I knew that there was a strong possibility that there would be injuries or even deaths because of this, and I quickly started to grab my cameras, my protective flak jacket, when another second explosion happened outside about 30 seconds after the first one. When I looked back out, that very boy that I had seen running was then lifeless, killed on the beach in the open, and along with three other boys who were playing with him. “And it’s pretty hard—in my opinion, would be—to mistake grown men and, you know, Hamas militants, at that, for children no more than four feet high wearing beach clothes, scattering from this initial explosion. I mean, in my opinion, it would be pretty obvious, especially given the 30-second window between the first explosion and the second that killed three of the four. One was actually killed by that first bomb. 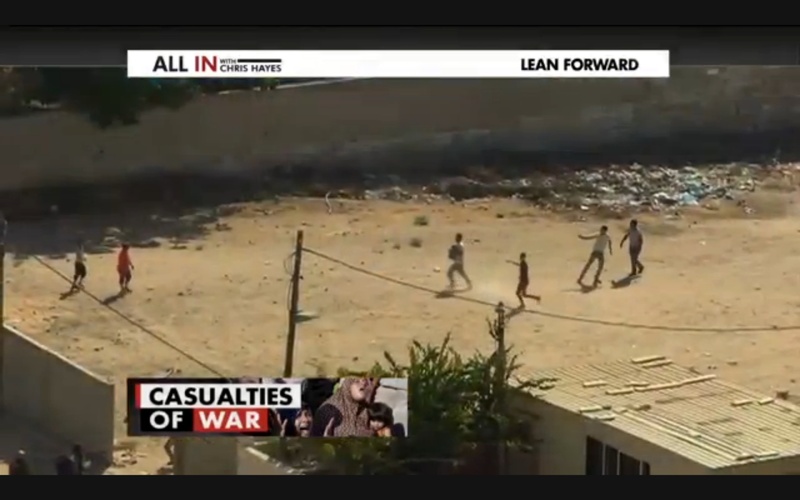 But that 30 seconds should be enough to assess whether or not those are children or civilians or actual Hamas militants. 6. Peter Beaumont, the Guardian. 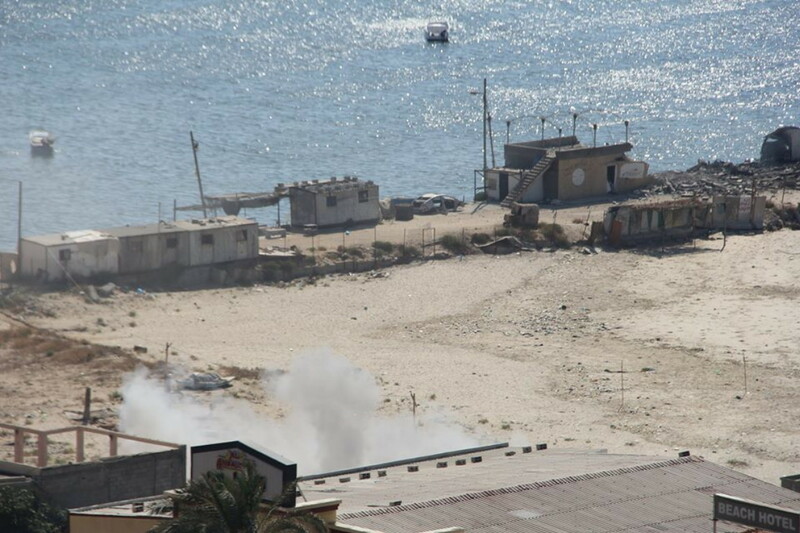 “The first projectile hit the sea wall of Gaza City’s little harbour just after four o’clock. As the smoke from the explosion thinned, four figures could be seen running, ragged silhouettes, legs pumping furiously along the wall. Even from a distance of 200 metres, it was obvious that three of them were children. 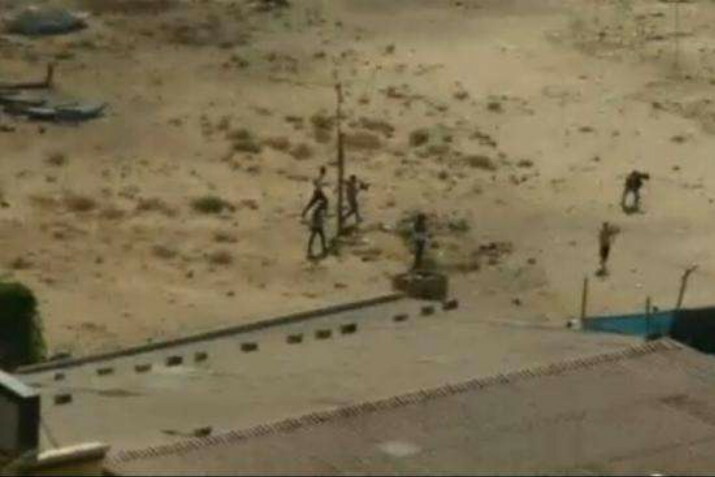 “Jumping off the harbour wall, they turned on to the beach, attempting to cross the short distance to the safety of the Al-Deira hotel, base for many of the journalists covering the Gaza conflict. “They waved and shouted at the watching journalists as they passed a little collection of brightly coloured beach tents, used by bathers in peacetime. 7. William Booth, the Washington Post. “I had just returned to the hotel to type up some notes and file inserts on the day’s news when there was a large explosion on the quay at the port, a little after 4 o’ clock in the afternoon. “We could smell the charge. I wondered: Did Hamas just fire a rocket? But it was the sound of an incoming round. We saw a small fisherman’s shack on the quay, churning with gray smoke. “Then we saw a gang of kids running from the shack, down the breakwater and onto the sand, hurtling toward al-Deira. A couple of waiters, the cook and a few journalists started waving at them. Run here! Then a second strike landed right behind them. 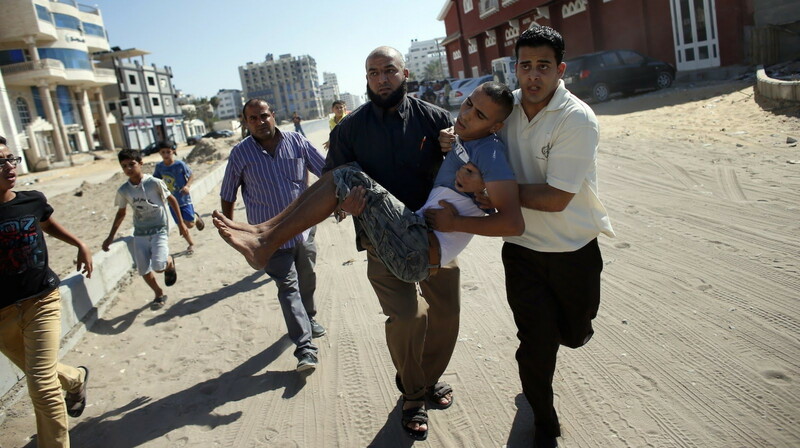 Fahd Abu Sultan, a 25-year-old laborer, paid dearly for an act of courage on July 16. 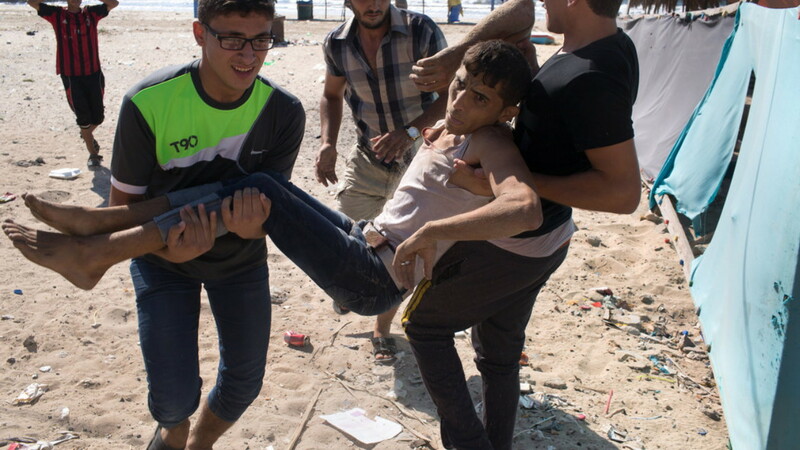 He rushed to help when an Israeli navy boat shelled a group of boys playing soccer on a Gaza beach, killing one and wounding others. As Sultan tried to carry away the wounded, the shelling resumed, killing three others. Abu Sultan has five gaping shrapnel wounds. He lay on a sofa in his home while male nurses changed the dressing, causing him so much pain he had to pause as he described how the rocket hit only meters (yards) away from him. Says that the four boys she photographed running were hit by a third projectile, and three were killed. 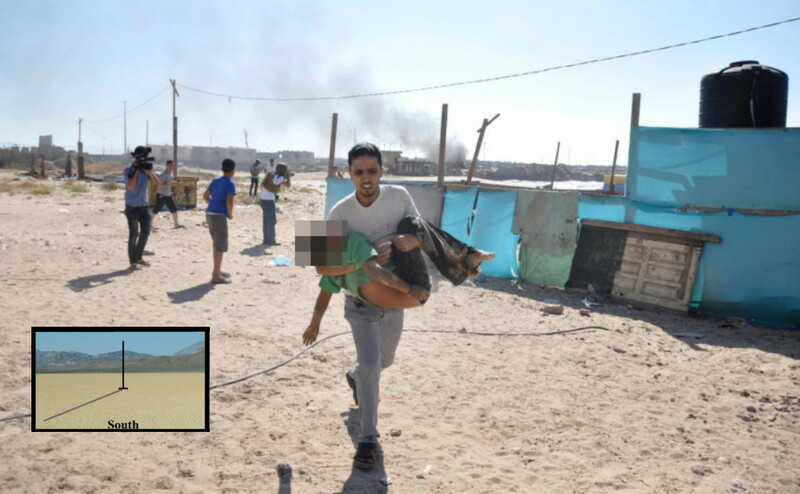 A witness who identified himself only as Abu Ahmed said the boys had been scavenging for scrap metal when the first shell hit a nearby shipping container used in the past by Hamas security forces. He said the boys fled but a second projectile “hit all of them”. 13. Abadallah (same source as above). Abadallah said he saw “white smoke coming from a small room, like a shack” belonging to one of the fishermen not far from the fishing port. Then he saw the boys running. 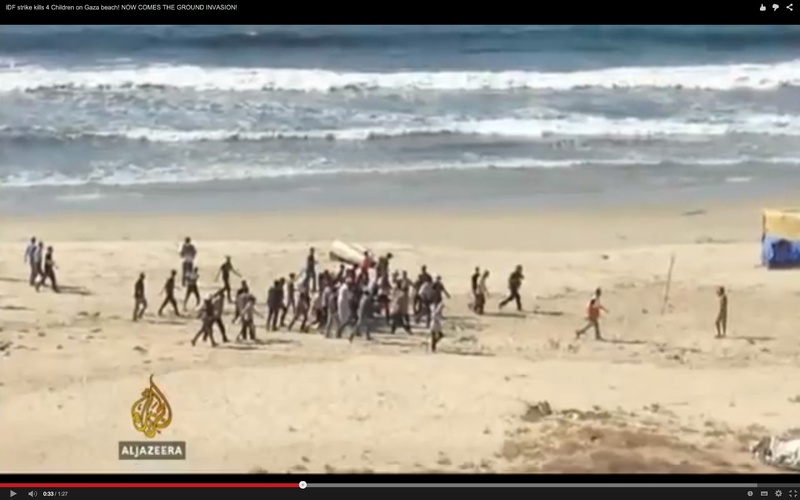 “We started shouting at them: ‘Run, run here.’ Then a shell from the sea landed behind them,” Abadallah said. Some journalists dining at the hotel jumped from the terrace and helped five children bleeding from shrapnel get to safety in the hotel. “I will never forget these horrible images,” he said. 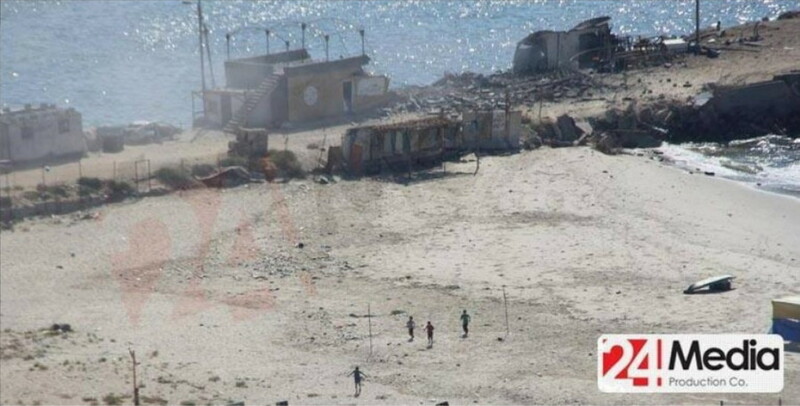 One boy killed by the first projectile, and three ran up the beach. The second shell hit the other boys while they were running, forty yards away from the initial strike. 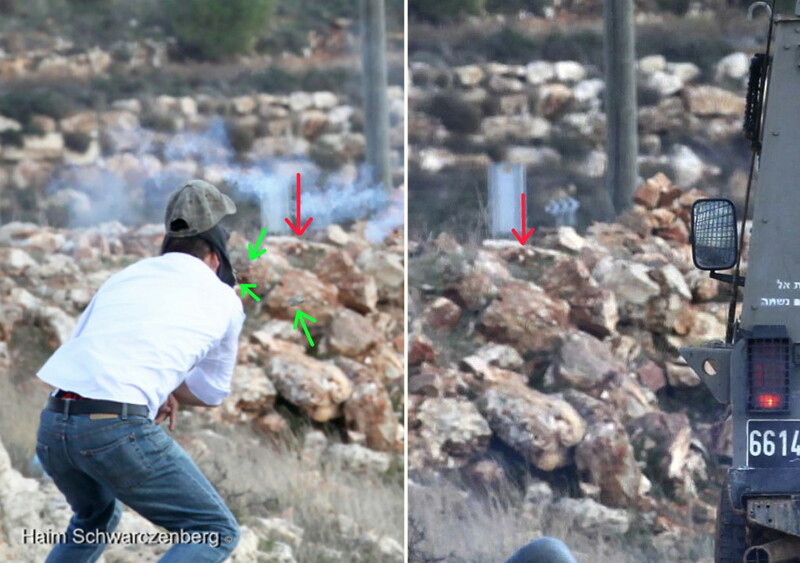 Ali Abu Hassera, a fisherman who was standing nearby, says the gunner must have adjusted his aim to target them. Three more were killed. They were thrown tens of yards apart by the force of the blast. 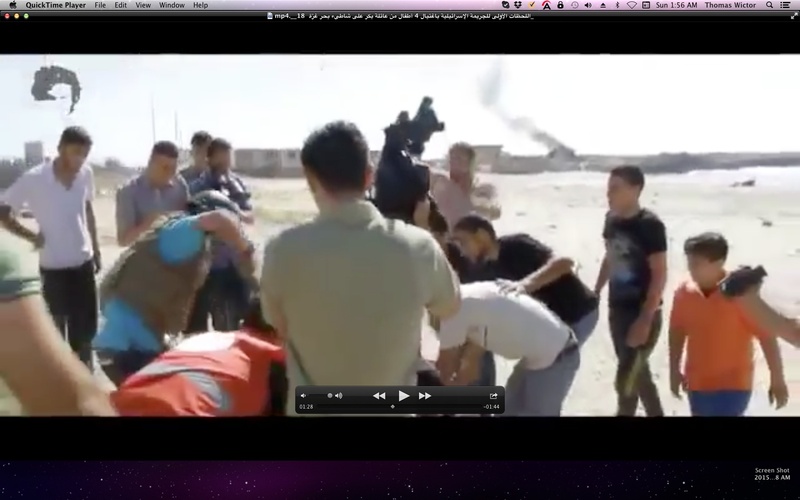 When Abu Haseera and his colleagues ran towards the boys to help, another shell hit, wounding two of them. 15. Jonathan Miller, Channel 4 News. 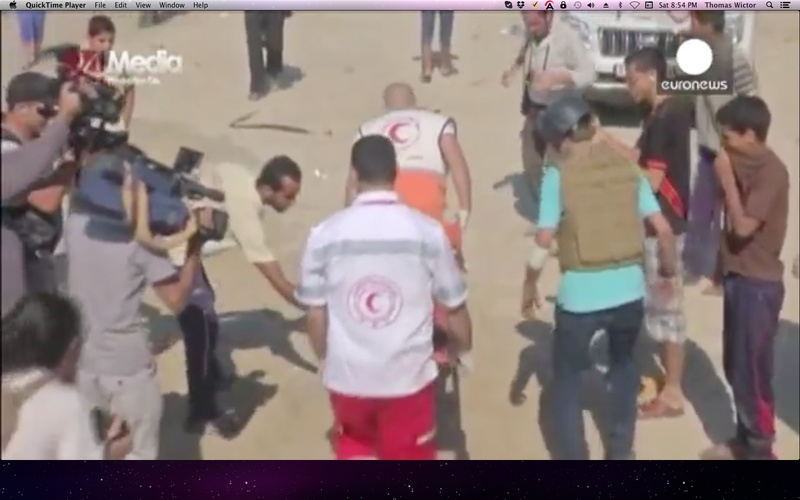 “We had just come back to the Al Deira Hotel from reporting at a hospital and was about to edit our piece for Channel 4 when it happened. “There had been a lot of heavy shellfire and outgoing rockets all day, and I was standing by the hotel window when there was the loudest, god-almighty explosion. I saw smoke rising from the beach and from a little hut. “Within a minute, journalists were running out from the hotel and people were shouting and pouring out of buildings to help. “Three children, struck by missiles while playing on the beach, were quickly carried onto the hotel terrace. They were covered in blood. Explosion at 1:26. No damage to container on breakwater. 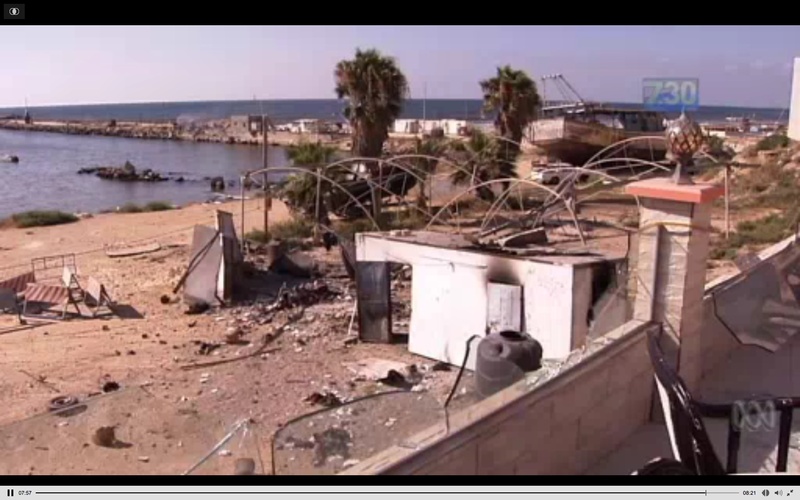 Blast damage to the terrace of the Adam Hotel, Australian Broadcasting Corporation, ABC News, “Family of boys killed by airstrike on Gaza beach speak,” 07:56. No visible fragmentation damage. Fenwick said that as he stood on the balcony of his hotel, he saw four boys killed on the open beach (eyewitness account No. 4, above). However, in reality he was on the breakwater with the reporters who first arrived. He ran past the empty place in the sand where the bodies were later discovered, so he therefore saw that the three dead children were not there. 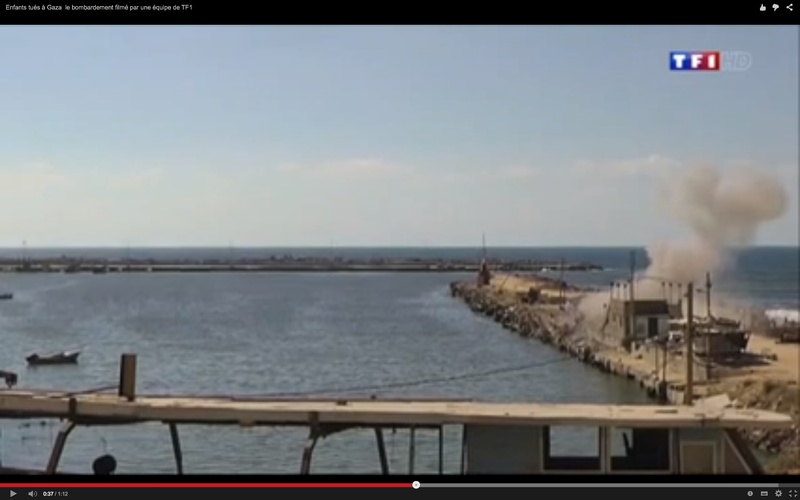 Fenwick is seen in 0:14 to 0:17 in the video above. 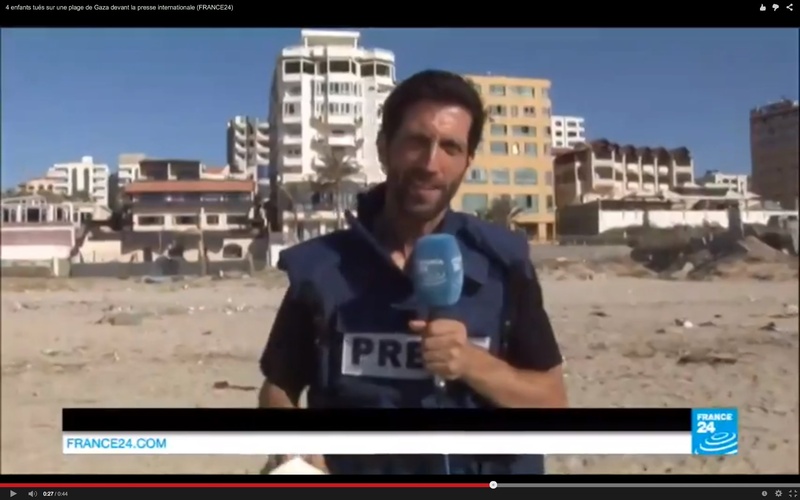 Here’s France 24’s report on the incident. You can see that Fenwick is wearing the same black shirt and large blue flak jacket as above. Israeli air-to surface missiles have high-explosive antitank (HEAT) warheads. A small missile like the Mikholit would first penetrate the steel container and then explode inside. 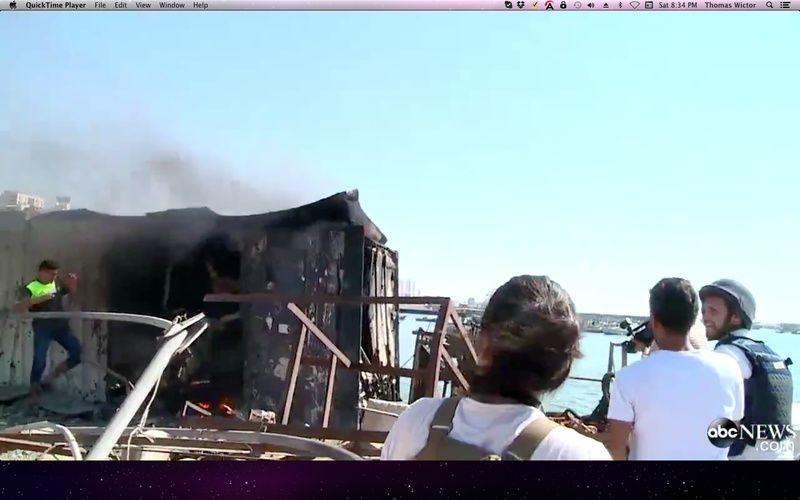 There’s a hole in the side of the container that perfectly corresponds to the smoke cloud seen in the TF1 News video. Also, if two men were going to fire a missile at a hotel, they would be in the open end of the container, right below the hole in the wall.